I’ve gotten lazy and grab a package of frozen vegetables to microwave instead of cooking the real deal. This recipe starts with baby carrots – no need to peel and slice. Put a cup or so of water in a medium pan, add carrots, cover and bring to boil. Steam/boil until carrots are crisp tender when pierced with a fork. That only takes about 15 minutes. So easy, it was not worth the fussin’ on my part –. The glaze is simple. The predominate flavor is the maple as the dressing just enhances it without competing or changing it. Glaze the carrots, add nuts and you have an impressive dish. That is really, really good. *I worked for a season in a children’s program with an elderly volunteer who was a gifted teacher. She could explain complex things so simply anyone could get it, keep the room organized and things moving. But she did not believe in praising children because, she said, they would get the “big head”. I think we all need to hear appreciation. Vee, here is yours! And thanks for sharing! An impressive dish for holidays and guests -- or just the family. Impressive and delicious! Put water in medium pan, add carrots and cover. Cook 12 –14 minutes or until tender, then drain. Mix dressing and syrup, stirring frequently, until glaze is thickened. Add carrots and butter. Stir until butter is melted and carrots are covered with glaze. Add pecans and stir to distribute. 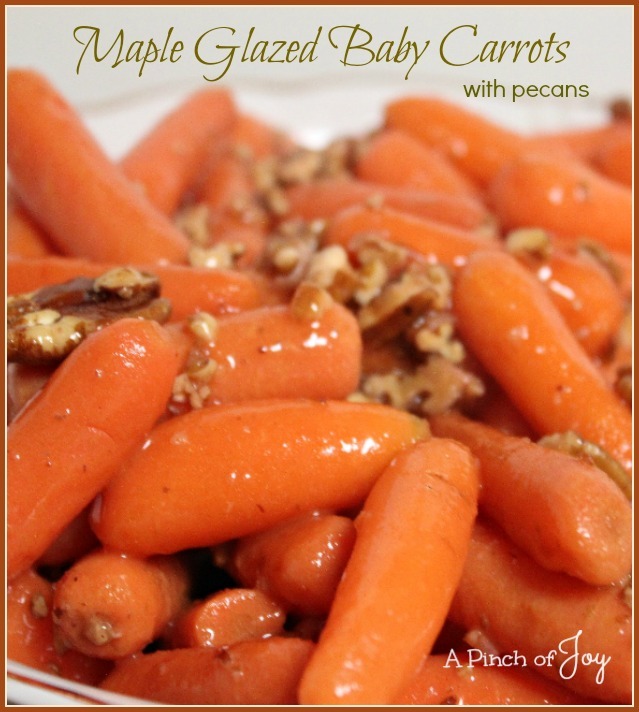 I can’t wait to try your Maple Glazed Baby Carrots, this is a wonderful recipe. Thanks so much for sharing with Full Plate Thursday this week. Hope you have a great weekend and come back soon! They look amazing! Thank you so much for sharing.